This week’s recipe for French Fridays with Dorie is Shrimp-Stuffed Zucchini Blossoms. Alas, I wasn’t able to locate a source for zucchini flowers. 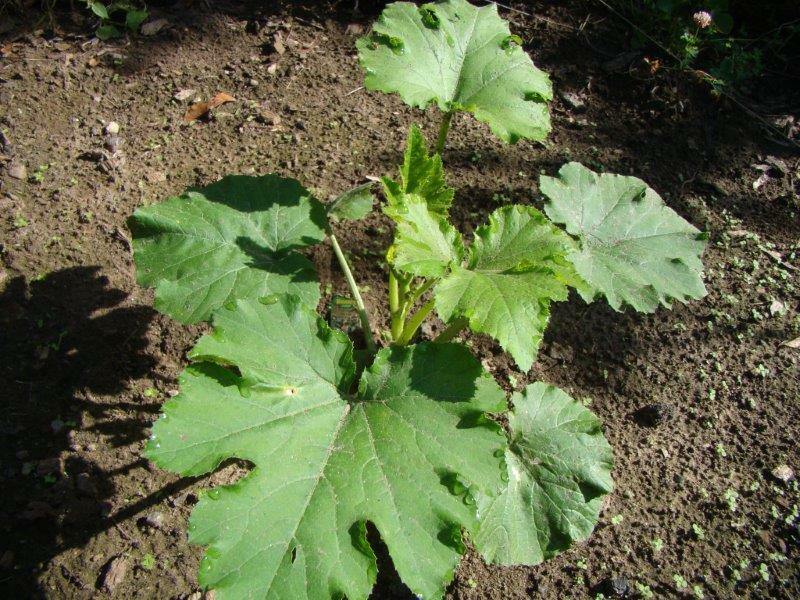 Ever the DIY-er in the kitchen, I planted a zucchini plant in the garden about two weeks ago (pictured above). I have high hopes it will produce a few flowers so I can try out this recipe, but it might not be until August. To see the zucchini flowers stuffed by my Dorista friends, follow their links here. To read about zucchini blossoms I stuffed several summers ago, check out my story here. Posted on 11 July 2014, in French Fridays with Dorie and tagged French Fridays with Dorie. Bookmark the permalink. 15 Comments. Ah the trials delayed gratification. :-). I can’t wait to see your flowers when they grow! Your plant looks nice and healthy! We planted some zucchini this year, but they’re not doing well. They were covered in aphids early on, so I don’t know if that kept them from getting strong early in the season. Now the sun is so hot and the leaves are so skimpy, that I don’t really expect them to produce much. The few zucchini it has turned out have all been shriveled yellow things. Yuck. You’ll love this when you finally get a few flowers! Betsy, I was recently in Rome, where fried stuffed zucchini blossoms are a specialty, and we tried them at 2 different restaurants. They weren’t stuffed with shrimp, but they were delicious! We went to an outdoor market, and they had zucchini blossoms over the place. I couldn’t believe it! Another specialty was fried artichokes. They were crazy good. You ate the leaves and stems too! YUMMY!!! Your plant looks better than the few I planted…I still have hopes! These were quite good I hope you get to try them before the end of the summer. Have a great weekend! So cute… we need a daily time exposure and a full report when the first blossom blooms. LOL its a healthy looking plant! Keeping happy garden thoughts in mind for you, Betsy! How fun it will be when you can make this recipe using your own home grown blossoms! I love that you planted a zucchini plant when the recipes were announced:-) Looks like it’s off to a good start. I just planted some herbs on my kitchen windowsill today and I’m hoping for some beginner’s gardening luck to help them along. Hopefully we will both be trying out this recipe soon! Okay, put your plant on a video cam so all of us can “watch it grow”. You and Cher do get one gold star for having made this in the past and having kept the photos. I still need to locate the blossoms and am hoping that I will be succesful this week at our Farmer’s Market. With any luck, you will have more blossoms (and zucchini) than you know what to do with! Mine are really starting to take off now. You definitely get an “A” for effort. I hope you have squash–and blossoms–soon. I was never able to find any blossoms. If I’d been thinking, I suppose I could have tried starting some zucchini, but these days, the only things the critters don’t eat are herbs and cherry tomatoes (and sometimes those too! ), I had to give up on other vegetables. Oh well, if I ever find some, I’m making these!